When Ben Franklin said that nothing in the world is certain except death and taxes, he obviously forgot about laundry. Perhaps that’s because he had a laundress to do it for him – but nowadays, most of us are stuck doing this job ourselves. In fact, according to the Environmental Protection Agency (EPA), the average American family goes through 400 loads of laundry each year – more than one load every single day. The good news is, thanks to the automatic washer and dryer, washing all those loads is a lot easier now than it was in the days of the washtub and scrub board. The bad news is, between the cost of electricity, water, and detergent, it’s also a lot more expensive. Fortunately, with just a few easy tricks, you can cut the cost of your weekly wash by half or even more. And don’t worry – none of them involve hauling your clothes to the nearest river and beating them against a rock. The cost to do a load of laundry varies widely depending on where and how you do it. If you use a coin-operated machine, what you pay per load is pretty much fixed. But if you wash at home, your choices make a big difference. Michael Bluejay, also known as “Mr. Electricity,” has created a handy calculator to figure out how much energy and money you spend on each load of laundry. It shows how widely the cost varies depending on the type of washer you have, the temperature of the water, the detergent you use, and how you dry your clothes. 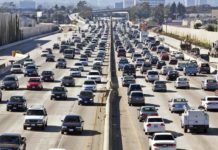 All the costs below assume that you pay $0.129 per kilowatt-hour of electricity – the average national rate, as reported by the U.S. Energy Information Administration (EIA) – and $5.50 per thousand gallons of water. The Most Expensive Way. If you wash clothes in a top-loading machine, using hot water, a detergent that costs $0.50 per load, and dry in an electric dryer, it costs about $1.52 per load. Washing 400 loads each year at this rate means you spend $608 a year on laundry. Cold-Water Savings. Simply switching from hot to cold water, with no other changes, cuts the cost to $1.18 per load. That reduces the annual cost of 400 loads to $472 – a savings of $136. Even doing just half your loads in cold water cuts the annual cost to $540. Lower Detergent Cost. If you switch to a cheaper detergent that costs only $0.10 cents a load, that cuts your cost per load by $0.40. Combine this with washing in cold water, and the total cost drops to $0.78 per load, or $312 per year. Saving With Line-Drying. Skipping the electric dryer and hanging your clothes on a line saves you another $0.43 per load. Combine this with using cold water and cheaper detergent, and your total cost is only $0.35 per load, or $140 a year. That’s less than 25% of what you pay washing the most expensive way. High Efficiency. If you use a more efficient front-loading washer, all your costs are lower. They range from $0.21 per load with cold water, cheaper detergent, and line-drying, to $1.22 per load with hot water, pricey detergent, and electric drying. That adds up to an annual cost between $84 and $488. Do Use Cold Water. About 90% of the energy a top-loading washer uses is for heating the water. As long as your clothes aren’t extremely dirty or greasy, cold water should do a perfectly adequate job. Don’t Wash Half-Full Loads. You use less energy and water on both washing and drying when you do full loads. However, if you must do a small load, you can save some energy by setting the water to a lower level. 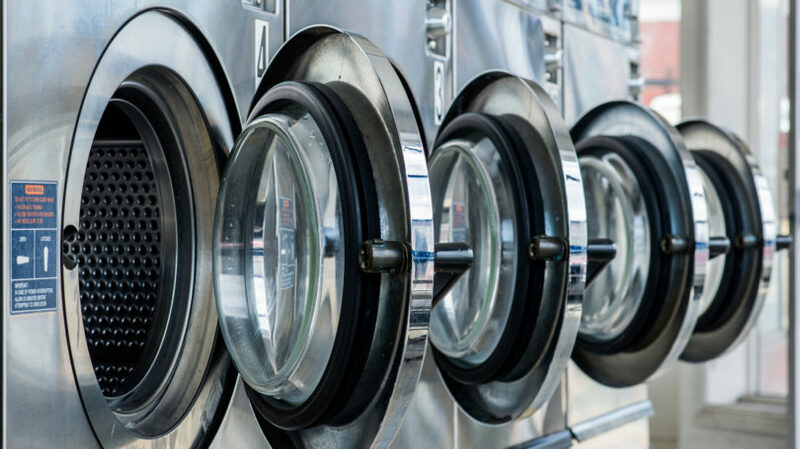 If you use a coin-operated laundry, you can save up your laundry for a week or more and wash a large load instead of a small one, since the cost is exactly the same. If you just don’t have enough clothes to wait that long for laundry day, try sharing a load with a friend or neighbor. Do Separate Your Loads. Heavy fabrics, such as blue jeans and towels, take longer to dry than lightweight shirts and underwear. Drying heavy clothes separately means you won’t waste energy on lighter clothes that are already dry. Don’t Over-Dry. Continuing to run your dryer after the clothes are dry wastes energy. In addition, Good Housekeeping notes that this can damage clothing and cause shrinkage. If your dryer has a moisture sensor, you can set it to shut off automatically as soon as the clothes are dry, rather than relying on a timer. Do Clean the Lint Filter. Remove the filter and peel off the accumulated lint after each load you dry. This helps air circulate better, so clothes dry faster. In addition, check the dryer vent from time to time to make sure it isn’t blocked by lint. This not only saves energy, but also helps prevent fires. Another way to cut your energy costs is to find out whether your utility has “time of use pricing.” This means that the company charges more per kWh during peak periods, when the demand is highest. For instance, Pacific Power charges more between 4pm and 8pm on weekdays in the summertime, and also during mornings and evenings in the winter. If you’re a Pacific Power customer, doing your laundry on weekends or after 8pm saves you about $0.01 per kWh, or around $0.06 per load. 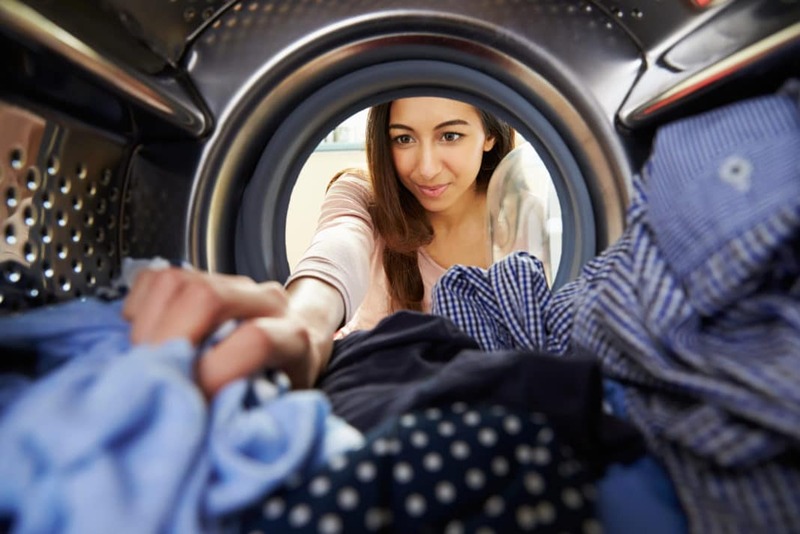 In addition to these energy-saving tips, there are several other tricks you can try to lighten the impact of laundry on your wallet. A large chunk of the cost of laundry is for drying. As Michael Bluejay’s calculator shows, it costs about $0.43 to dry a load of laundry for 45 minutes in an electric dryer. In a gas dryer, the same load costs about $0.24 – assuming you pay the national average price of $1.07 per therm, or $10.97 per thousand cubic feet, as reported by the EIA. However, the cheapest way of all to dry your clothes is to use a solar clothes dryer – otherwise known as a clothesline. Of course, in some parts of the country, it isn’t warm enough to line-dry clothes all year long. But even line-drying just 50 loads a year saves you $21.50 per year compared to an electric dryer, or $12 compared to a gas dryer. The downside of line-drying is the extra time it takes. When I line-dry my clothes in the summertime, it takes me about 25 minutes to hang them on the line, plus another 5 minutes to take them down when they’re dry. That’s half an hour of my time to save the $0.24 it would take me to dry the clothes in my gas dryer. If hanging my laundry were a job, it would pay me only $0.48 an hour. To me, the extra time I spend on line-drying is worth it because I enjoy the fresh air and exercise. But I also do only one or two loads of laundry each week. If I washed more than seven loads a week like the average American family, it would take me nearly four hours each week to hang them all. The best laundry detergents are often the most expensive. In comparison tests performed by Good Housekeeping, the best-rated detergent, Ultra Tide Plus Bleach, costs $0.53 per load. A similar test at The Sweethome gives top marks to Tide Plus Bleach Alternative HE Liquid, at $0.36 per load. However, both these tests find that you can get results almost as good with a cheaper detergent. The store brand from Target, priced at around $0.11 per load, does as well as Tide with most types of stains. Switching from Tide to the Target brand saves anywhere from $0.25 to $0.42 cents per load. For a family that does 400 loads a year, that’s an annual savings of $100 to $168. You can cut the cost per load still more by making your own detergent. 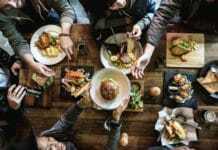 Testers at The Sweethome, who tried several DIY recipes, report that they can cost as little as $0.04 per load. However, they also say that the homemade detergents don’t get clothes nearly as clean as store-bought ones. And for users who are hoping homemade detergent will be less toxic, The Sweethome warns that most recipes call for sodium carbonate (a cleaning agent also known as washing soda) and borax, which are highly caustic and poisonous. Also, just like line-drying, making your own detergent takes time. If you spend half an hour to mix up a 50-load batch, and you save $0.07 per load by using it instead of the Target brand, then your total savings is $3.50 for half an hour of work, or $7 per hour. That’s more than you can save with line-drying, but it’s still less than minimum wage. A quicker way to save on laundry detergent is to look for sales and coupons. For example, at stores in my area, Purex liquid detergent often goes on sale for $1.99 for a 33-load bottle – just over $0.06 per load. Adding a 50-cent coupon cuts the price to $1.50, less than $0.05 per load. Another way to cut your detergent cost is simply to use less. 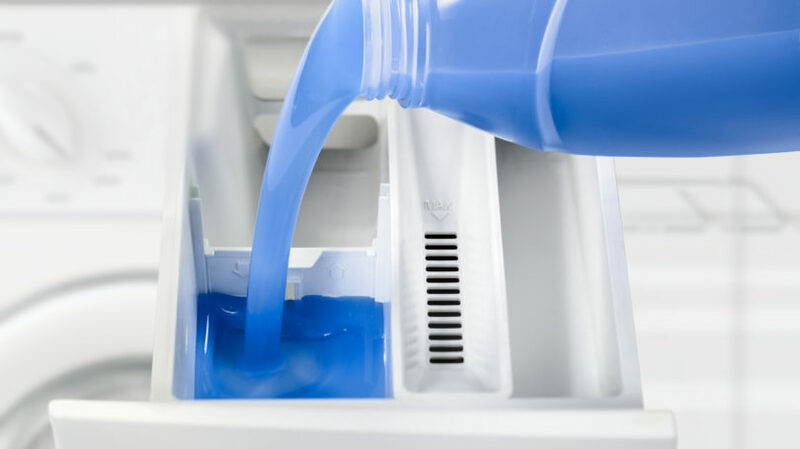 According to a 2010 article in The Wall Street Journal, most Americans use more detergent than they really need to. They fill the cap or scoop all the way to the top instead of looking for the line that shows the right amount. If your detergent costs $0.50 per load, then using 50% too much adds an extra $100 a year to your laundry tab. In addition to checking the fill line, you should also adjust the detergent level based on how dirty the clothes are. Workout clothes or gardening clothes need more, while dress clothes need less. In fact, in many cases, you can get laundry clean without using any detergent at all. According to Jeffrey Hollander of the green-cleaning company Seventh Generation (interviewed for The Wall Street Journal article), the agitation of the water alone is enough to get the dirt out of most loads. When The Straight Dope column ran a test in 1997 to see whether detergent-free laundry balls were effective, they found that clothes washed with plain water got just as clean as those washed with Tide. So if your clothes aren’t all that dirty, try using less detergent, or even none at all. By using half as much as usual, you can cut the cost of the top-rated Tide detergent from $0.53 to less than $0.27 per load. Over 400 loads, that’s a savings of $106. As Michael Bluejay’s laundry calculator shows, front-loading washers are much more efficient than traditional top-loading washers. Not only do they use less water and electricity, they also spin more water out of clothes, so they spend less time in the dryer. If you’re using an old top-loader, upgrading to a new front-loader can save you anywhere from $0.15 to $0.30 per load. For a typical family, that’s a savings of $60 to $120 per year. On the other hand, in order to cash in on this yearly savings, you have to spend a big chunk of change up front. The best-reviewed front-loading washer at ConsumerSearch is priced at around $1,000, which means it would take between 8 and 16 and a half years to pay for itself in lower utility bills. Even the site’s top budget-priced front-loader costs $700, which means a payback time between 6 and nearly 12 years. People who wash more loads, or who always use hot water, will see the fastest payoff. However, if your old washing machine has just died and you’re shopping for a new one, then a front-loader is a reasonable choice. The best-rated top-loader at ConsumerSearch costs about $400 to $600 cheaper than the best front-loader. However, the front-loader’s lower energy costs will make up the price difference in 3 to 6 and a half years. For the more modest $700 front-loader, the payback time could be less than one year. If you are stuck washing your clothes at a coin-operated laundry, you can’t do much to change your price per load. However, you can still cut your yearly laundry budget by washing fewer loads. One way to do this, as noted above, is to wash only full loads. However, you can also cut the number of loads you launder by wearing your clothes more than once between washings. According to Good Housekeeping, only some items, such as t-shirts and underwear, really need to be washed after every wearing. Others, such as jeans or work clothes, can be worn several times before laundering. Towels can be used three or four times before washing, while bedsheets can stay on the bed for up to two weeks. If you currently shell out $6 per week to do two loads of laundry – $1.50 to wash each load, and another $1.50 to dry it – then your annual laundry bill comes to $312. Cutting back to just one load per week would save you $156 per year. Even if you wash your clothes at home for $1.52 per load, you could cut your annual cost by around $79. As a bonus, washing your clothes less often also helps them last longer. So you can cut your annual budget for new clothes, as well as the amount you spend on washing them. Obviously, the more of these tips you use, the more money you can save in the laundry room. However, the single strategy that offers the biggest bang for your buck is to wash your clothes in cold water. It doesn’t save quite as much money per load as line-drying or changing detergents, but it doesn’t take any extra time, and it doesn’t involve any sacrifice of cleanliness. And since many coin-operated laundries charge less for loads washed in cold water, it’s a tip that works for apartment dwellers too. How often do you do laundry? Do you have any tips for lightening the load?